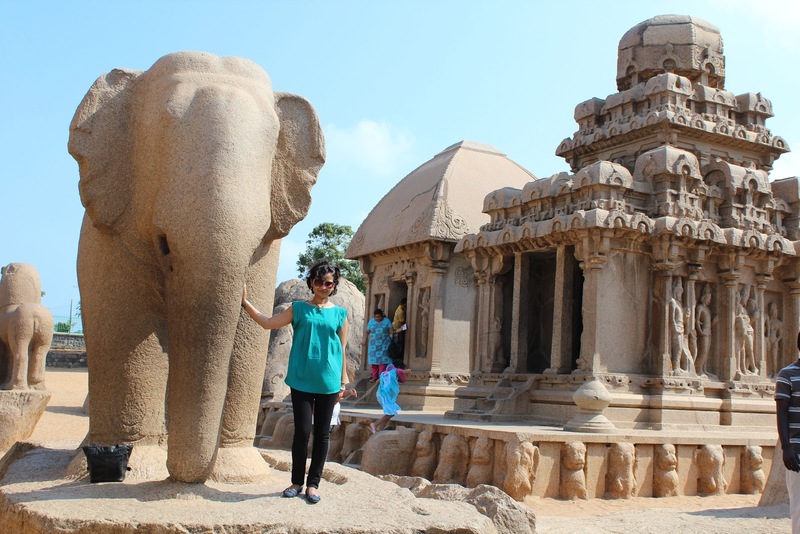 Recently we have begun adding smaller 'culture tours' within India to our vacation plan every year. During my childhood days I remember taking long train journeys to distant parts of India during summer vacations that left an lasting impression on me. Now, as the parent of a ten-year old girl, I realise I haven't given her the same chance to discovery our country. She has seen more places outside India than she has within; I am hoping to rectify that. We had covered the ancient Mughal capital of Agra two years back. 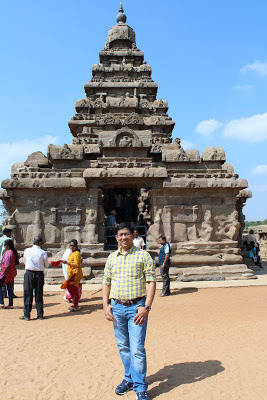 This time I decided to use our Xmas break to travel to the lands where the Pallavas and Cholas once ruled. Chennai is clearly at its best during the Christmas season. It's notoriously warm and humid weather is replaced by a rare dry and cool climes. Evenings were lovely when we would go up for a swim on the terrace-top swimming pool of our hotel. The traffic too was at the best I have ever experienced in this city. Our first stop was Mahabalipuram, whose rock-cut temples and frescos are still mired in mystery. 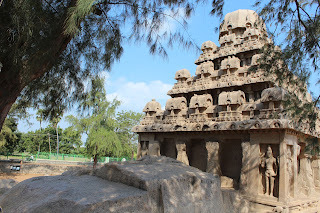 Most modern sources place these temples from the times of the Pallavas around 7 AD. 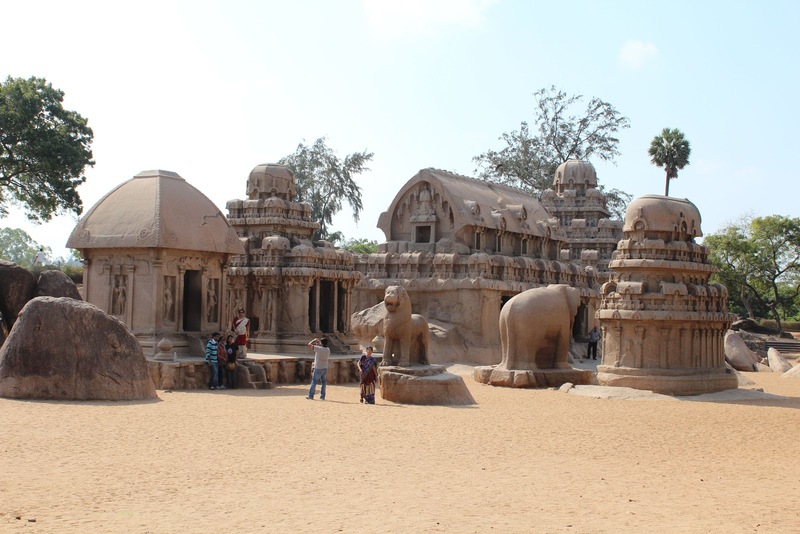 The temples and structures depict several Hindu deities but are extremely varied in their architectural forms. 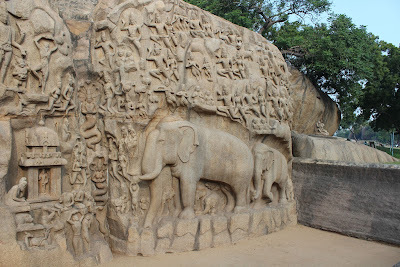 The most detailed and elaborate of the Mahabalipuram stone carvings is clearly the one called Arjuna's Penance which is an enormous open air bas relief that depicts scenes from Hindu mythology and even includes a reference from the old folk story of the cat that went on a pilgrimage. 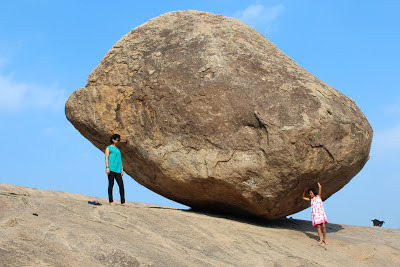 Krishna's Butterball is a large spherical granite rock precariously perched on a granite surface. As stories go here, this ball has stayed in place even through earthquakes and tsunamis. 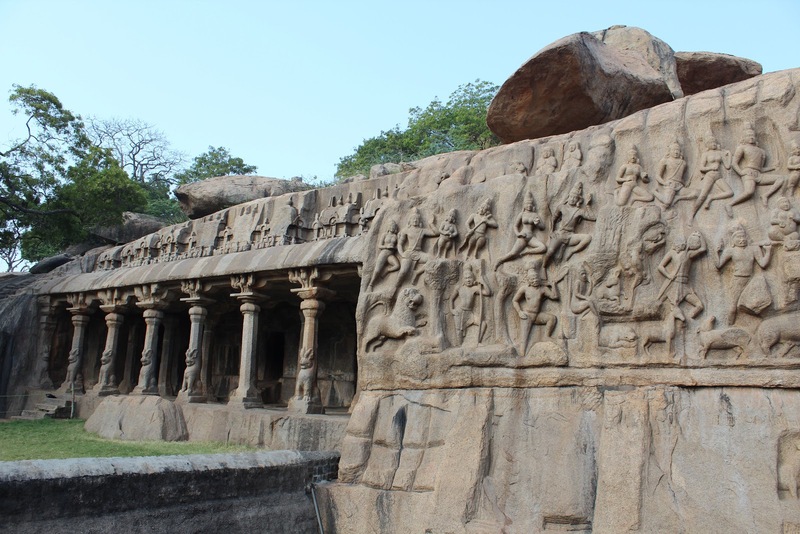 The Five Rathas are said to pay homage to the five Pandava brothers from the Mahabharata. Each temple cut from a granite rock formation is inspired by a distinct architectural form: Bengali, Dravidian and even Sri Lankan. 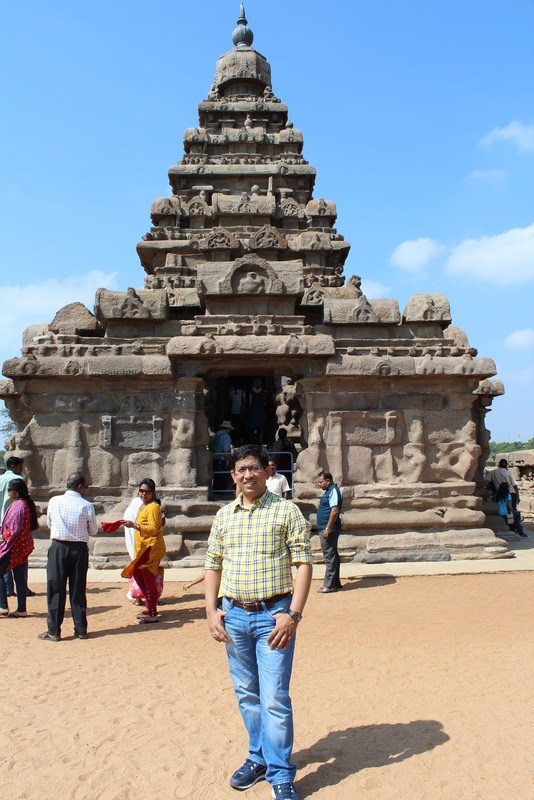 Finally, the Shore Temple where the Bay of Bengal crashes into the rocky shores only a few feet away. 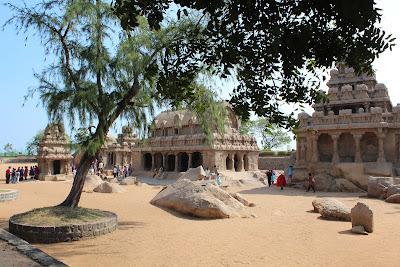 This temple is said to be among the ones which Marco Polo wrote of as the Seven Pagodas of Mahabalipuram. Interestingly, the Pallava kings who carved these temples pain-stakingly from granite hillsides are postulated to have descended from North Indians who moved south. 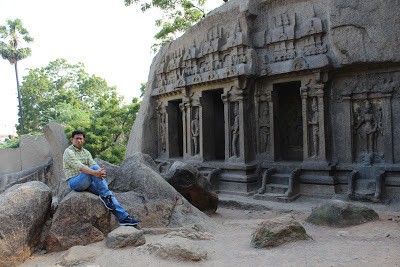 There is evidence they used Prakrit script in their writings, which is closely related to Sanskrit. Among the many mysteries of Mahabalipuram is a temple dedicated to Lord Brahma, something very rare in India. Also, there are several structures that seem abandoned in mid-creation. In fact, a lot of the hillside behind Krishna's Butterball seems like a workshop. The sun was quite high when we got back into our car and headed back towards Chennai. 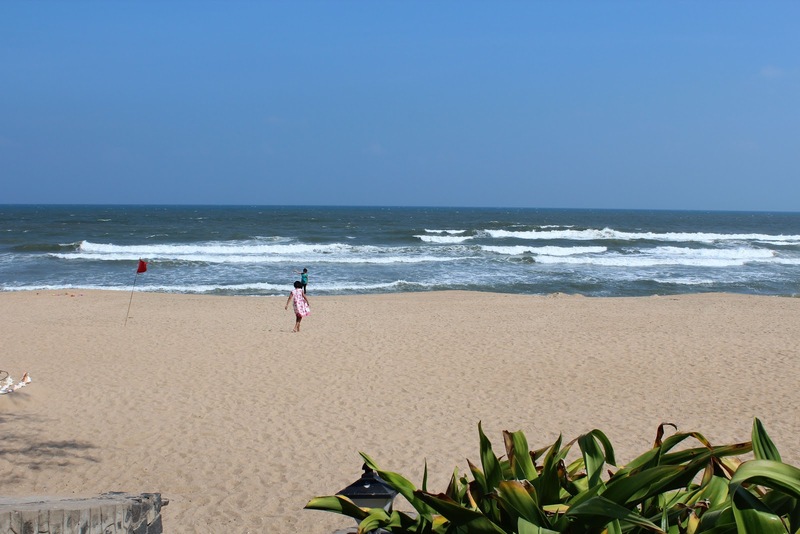 The drive is a very scenic one with glimpses of the sea along the road. We paused at Fisherman's Cove for lunch. This was once a fort that changed hands multiple times between the English and the French during their battles to keep a larger part of India with themselves. 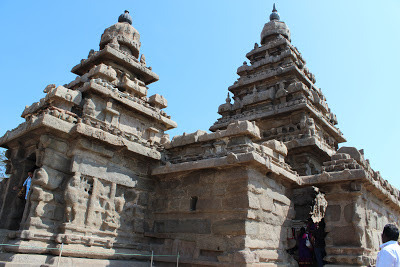 Eventually, the French were restricted to a smaller pocket to the south of Mahabalipuram. 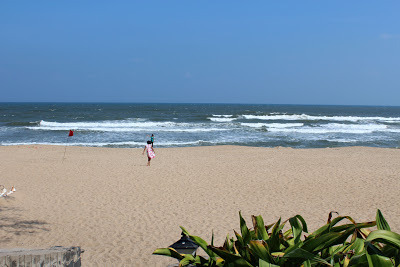 Chennai is one of the rare places that doesn't fascinate me much, but your pictures and story could change my viewpoint! Interesting. 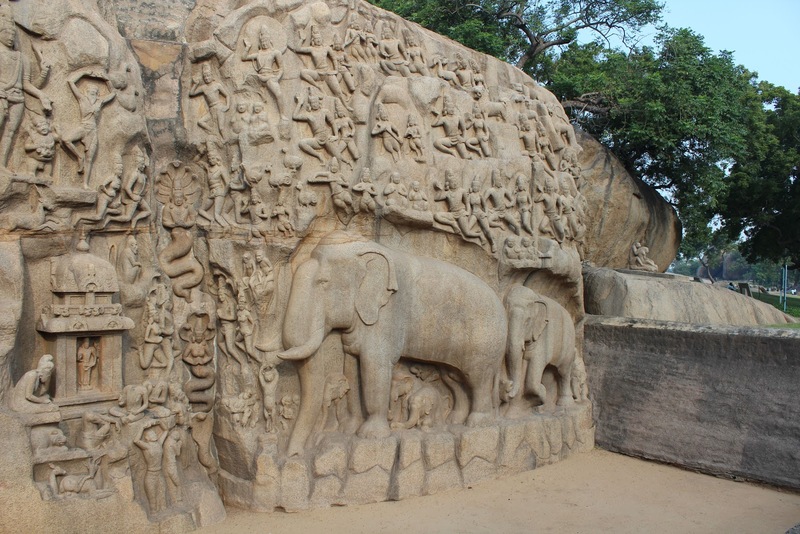 Did you visit the Crocodile farm on your way back to Chennai from Mahabalipuram? @wehearttravelling: Had thought of stopping by, but then it got late and we were hungry. So passed. 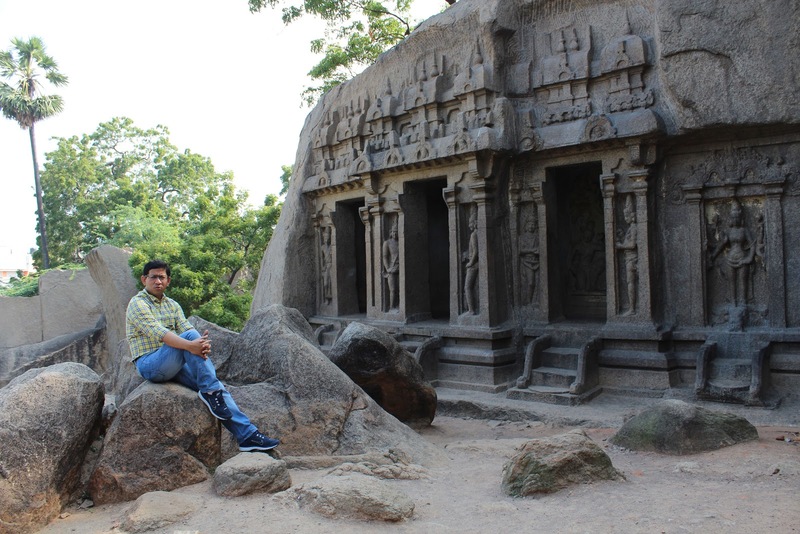 Madras is a treasure house for culture...I just love the city.